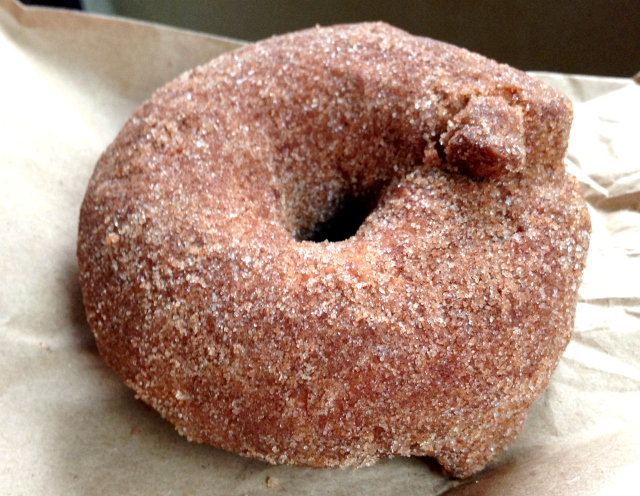 Here’s the deal with gluten-free donuts at Do-Rite: you’ll notice right away they are not a strictly gluten-free bakery. They prepare their gluten-free donuts separate from “regular” donuts and FRY them in a separate fryer. Did you catch that? I said FRY. 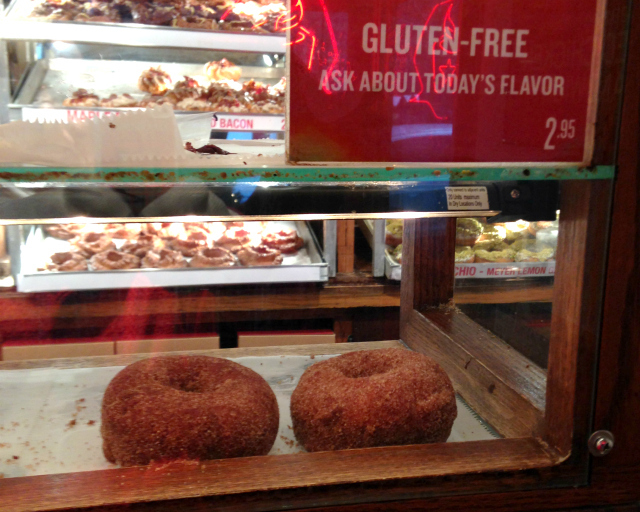 These are not the gluten-free baked donuts we buy at many of the donut shops that offer a safe alternative for us. They are fried donuts! Soft, yeasty, just like a donut should be. 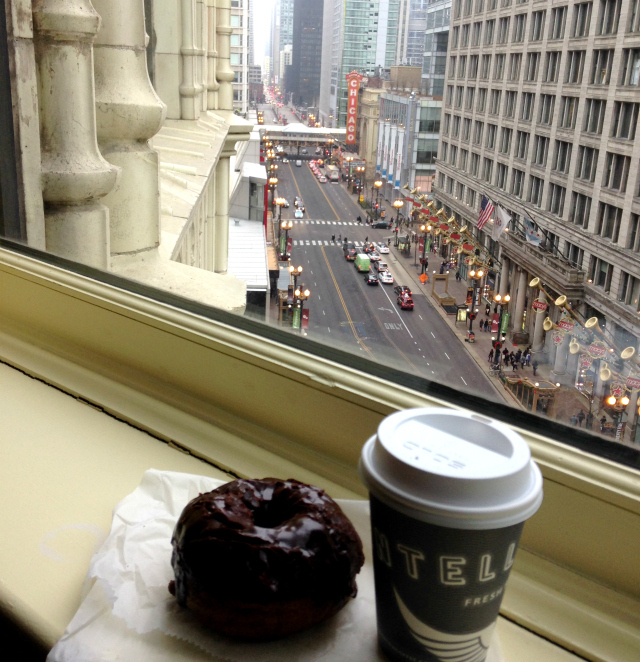 My absolute favorite way to spend a chilly day in Chicago: a Do-Rite gluten-free donut and a steaming cup of Intellegentsia Coffee from my favorite hotel room with a view. While there aren’t as many flavor options as their line of “regular” donuts, it’s a nice selection. Because they prepare the gluten-free donuts separately each day, whey they are gone, that’s it for the day. I call ahead and order what I would like to guarantee my order is available. Sometimes that includes buying an entire dozen for the flight home. 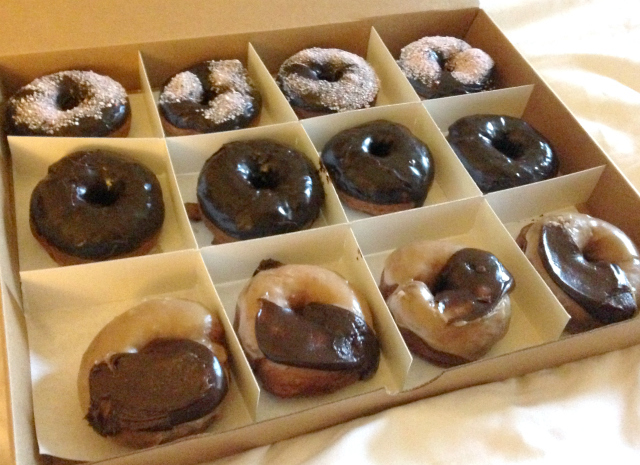 I love the box that keeps the donuts each safely nested without touching the others. Do-Rite gluten-free donuts are superb from start to finish and this box really shows that attention to detail in all of their donuts. 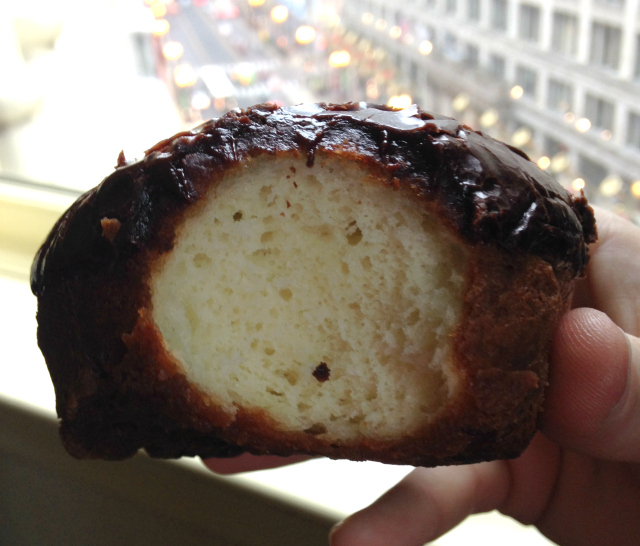 My favorite flavor at Do-Rite: the chocolate cake donut dipped in Valrhona chocolate glaze. The cinnamon sugar is a close second, the birthday cake another one I enjoy. Really, I don’t think you can go wrong with any flavor they offer. But don’t pass up one of their chocolate donuts! I’ve also visited when peanut butter chocolate and chocolate peppermint were offered, both excellent choices. You should probably just try them all. You know, just to be sure you’ve found your absolute favorite. Look at that light, fluffy cake! I’ve asked Do-Rite about shipping and they said no because the donuts are too fragile and aren’t optimal after being shipped. I love that they care about the donut-eating experience and don’t want to sell a substandard product. I also asked about the special flavors and was told if the toppings/frosting are something that is gluten-free, they can make it happen. So kind and really caring about their gluten-free customers. When can we go to Chicago?!!! I want!! Love your recommendations, the giant donut, the special box (now that’s caring!! 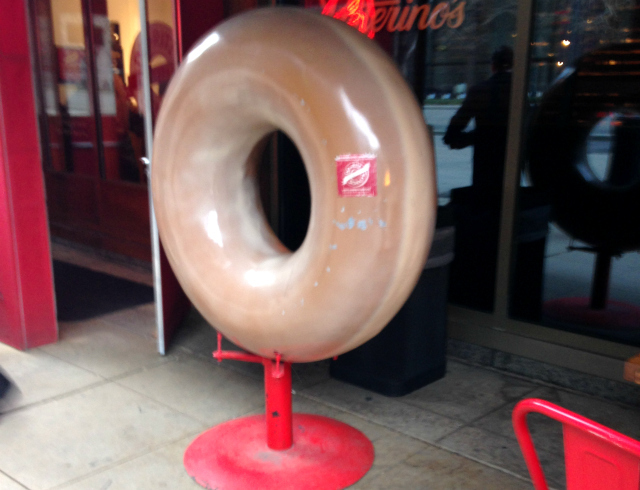 ), and that they don’t ship because they want to ensure their donuts are the very best! 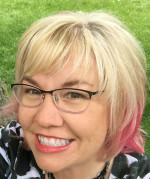 Chicago is so much fun for gluten-free folks. Let’s go soon! Donuts is my favorite !! I love it !! It is so great !! Mine, too! No one does gluten-free donuts better than Do-Rite!